NEW YORK ? The Intelsat satellite thathas remained inswitched-on mode while in an uncontrolled drift along an orbitalhighway,posing broadcast interference threats to other satellites, is nowexpected tocontinue to emit signals at least through late November and perhapsuntil lateDecember, Intelsat officials said. The Galaxy 15 C-band telecommunicationssatellite, which went outof control in April and has since been drifting eastwardalong thegeostationary arc 36,000 kilometers over the equator, is proving moredurablethan predicted. When it first failed, Intelsat and the satellite?sbuilder,Orbital Sciences Corp. of Dulles, Va., had estimated that it would losemomentum control in August. When that happened, the satellite wouldlose its ability topoint its solar arrays to the sun. Its power would drain and thespacecraftwould shut down. At that point, Orbital and Intelsat hoped to use abriefwindow of opportunity to push the equivalent of a reset button on theassumption that that alone would cause the 7-year-oldsatellite to return to normal functioning. If the satellite could not be returnedto service, at least itwould be in the "off" position, meaning it would join the more than100 satellites that have failed or been left for junk on thegeostationarybelt, much like shipwrecks along a heavily used maritime route. Instead, the satellite has takenadvantage of eclipse periods,when it is in Earth?s shadow, to slow down the draining of its momentumsystem,extending its electronically active life and continuing to poseheadaches forIntelsat and the owners of every satellite whose orbital neighborhood Galaxy15 enters. 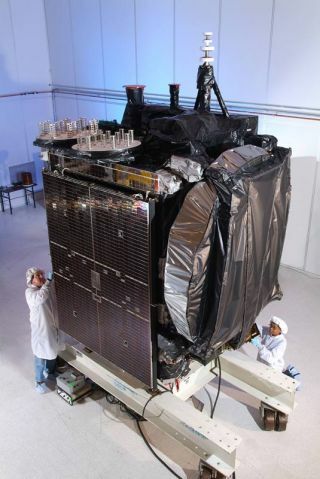 "We have been surprised by this," saidTobiasNassif, Intelsat?s vice president for satellite operations andengineering. "Thisis really a robust satellite. But to our knowledge this has been anunprecedented situation, and we are learning as we go." Luxembourg- and Washington-basedIntelsat investedconsiderable resources to design a maneuver that would permitsatellitesthreatened by Galaxy 15 to avoid the uncontrolled spacecraft as ittraversedother satellites? orbital positions, which are often referred to as"boxes." SES of Luxembourg was the firstIntelsat competitor with asatellite in harm?s way. SES and Intelsat devoted considerableresources in Mayto avoiding interference with SES?s AMC-11 satellite, and that modelhas beenused since to avoid interference on other companies? spacecraft. Thework paidoff, and SES reported that none of its AMC-11 customers lost itsbroadcastsignal. Intelsat has repeated that maneuver,with minor variations,for a half-dozenother satellites since June and now faces continuing thedrill for sevenmore spacecraft between now and late December. These include asatellite ownedby Satmex of Mexico, two Anik spacecraft owned by Telesat of Canada,three moreSES-owned satellites and, on Dec. 25, an Intelsat satellite. Most of these collision- andsignal-avoidance operations willbe simpler than the first operation in early June because Galaxy 15?sorbit hasdegraded from full geostationary, meaning it wanders above and belowthe arc,sometimes only barely touching the orbital slots of other satellitesalong itspath. In an interview here Oct. 13 during theSatcon conference,Nassif said Orbital Sciences has been able to reproduce the low-levelelectrical short circuit on the ground and then confirm that, once shutdown, asatellite in this situation would return to normal status. Nassif said he remains unconvinced thata solar storm in earlyApril caused the problem, saying that if that were the case the loss ofcontrolwould have taken more time to occur. He said there are several theoriesof whatcaused the problem. Orbital Sciences has since modified its spacecraftso thatthe same kind of outage does not permit the satellite to wander off inswitched-on mode. Intelsat has not written off the entirevalue of the Galaxy15, and the company hopes it will be able to recover its full use. Butthat willrequire Intelsat and Orbital to act quickly once the satellite losessun-pointing ability. What Intelsat is hoping, he said, isthat as Galaxy 15?sbatteries drain from lack of solar power, the satellite will bespinning on itsaxis slowly enough to force a complete shutdown from power deprivation,butfast enough to prevent its propellant tanks and other gear fromfreezing. Intelsat and Orbital then would restartthe satellite duringthe period when its solar arrays are pointed to the sun. Both companieshavesaid that, in theory, the reset should result in a fully operationalsatellitethat can be returned to service for another seven years or more. Galaxy 15 was launched in 2003 and wasdesigned to operate for15 years. Life'sLittle Mysteries: How Much Junk is in Space? Thisarticle was provided by SpaceNews, dedicated tocovering all aspects of the space industry.